WE AT TVC ARE MOST PLEASED TO PRESENT A REVIEW BY OUR SENSATIONAL GUEST REVIEWER LYNETTE. Heinrich Böll’s The Clown jumped off the library shelf with its clown face cover. It was in synch with the contemporary news reports of creepy clowns that had been doing the rounds of e media. Having never heard of the writer, I was surprised at how popular and prolific he was as a novelist and poet, being well known as a best seller largely on the back of this 1963 classic, set in post-war Germany. Who other than children think that clowns are funny? 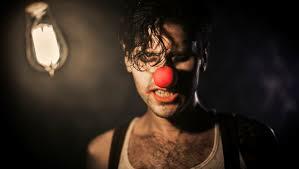 I may be mistaken but most adults view clowns as sad, creepy, superficial and pointless, obviously seeing behind the smile, make-up and feeling the human condition. This story grabs the pathos and sadness that is associated with a washed-up clown. His skills have deteriorated, his magic dried up and his reviews have been clown-career-destroying. This in itself is beautifully written as a story of decline and redundancy. It reminded me of the many work stories of my colleagues and myself as we continue to remain at our best as ove- 50 year olds in the ever-demanding workforce. However the main power of this novel for me was the weaving themes of love, religion and exclusion (or difference) and how these strands of life create strong emotions that are difficult to bear at times. The whole novel describes a day in his life, writhing through his thoughts, dwelling on his lost love Marie, his discarded family, religious friends and traverses the reflections about his life so far & his sense of being an outcast – and he is all of 26 years old! If you dont like detail about the human condition this is not a book for you. I loved the simplicity of the story; it made laugh and made me sad, but most of all I couldnt help but engage and identify with the main character Hans. Well worth a read and as relevant today as it was in 1963.